This post was inspired from a video that I found on Youtube called 30 Random Things to Know Before Coming to Thailand. I started to comment on that video and then that comment started to turn into an article so I decided to do just that. I wrote this article that compares those random things about Thailand to my experience living in Eastern Asia: China, Korea, Taiwan and traveling to Japan and Thailand. Many things she mentions in that video are similar to Eastern Asia. These are things relating to the culture and the environment. When I counted them I only got 23 random things... I might have combined a couple... Anyways. She recommended that you get one of these tennis racket looking things. This is good advice especially if you are living some place hot and tropical. I remembered there were quite a few mosquitoes in Taiwan as well. People used those too. It can be really annoying if you get mosquitoes in your apartment at night and you're trying to sleep with one buzzing in your ear. Mosquitoes are also common in China, Korea and in Japan. I did notice though that there are fewer of them in the big cities, especially in Korea. I noticed that when I moved out to Changwon from Busan. There were more mosquitoes. One of the creepiest things I saw there was this fog-like chemical spray used behind scooters and trucks to prevent mosquitoes. Soon as I heard those scooters coming I would close my windows. It smelled awful and I suspect it was quite toxic. But as you can see in the video those kids didn't mind. 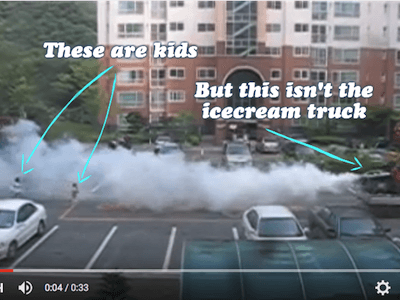 I was told in Korea that it was DDT, but then someone said online it's a mix of kerosene and some insecticide. A mosquito zapper is much more friendly to people and the environment. In the video Regina states to not handshake in Thailand... unless of course they initiate it first. It is less common in most of Eastern Asia compared to the USA too. But it is still common, so that might be a difference between eastern Asia and Thailand. But the handshake is usually not so vigorous like in the USA. So for instance when you meet your employer or interview they may or may not shake your hand. Apparently in Thailand the "wai" is a common greeting. This is when the hands are placed in a prayer like position in front of your heart and you bow. Bowing can be used in Japan too fairly commonly. Although it is stylistically different it can be used to greet someone, ask for a favor, when starting a meeting, ceremony or class, or when worshiping. In Korea, China and Taiwan bowing is not very common. I would sometimes see bowing like the "wai" in temples. Some Buddhists may do this or other people praying to their ancestors. She suggests drinking only bottled water in Thailand. Although I heard that you could boil it in Eastern Asia at least in the cities where I was living. But I exclusively drank bottled water in Taiwan, Korea and in China. I think that it is fine to drink tap water in Japan for the most part. It's a pretty modern place and even the tap water near Fukushima has been declared safe to drink. She recommends carrying your own toilet paper or tissue paper as most bathrooms do not supply TP. Most public restrooms in China, Korea and Taiwan also do not supply toilet paper. You can buy this at the local convenience store. 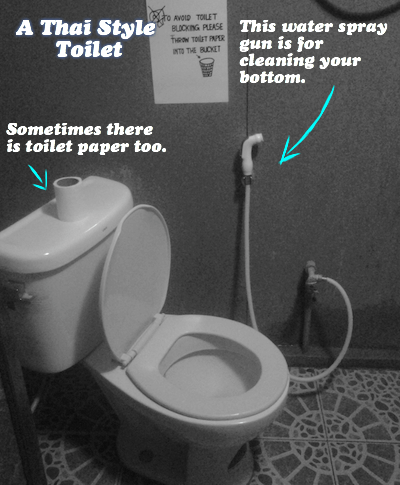 Funny, I remembered in Thailand there were these hoses next to the toilet to wash with instead of TP. The ones I remembered were not so much like the high technology ones that you would find in Japan, but were more low technology. They were more like a garden hose right next to the toilet so you could wash your bottom. It's a little different at first, but I thought it was fine. It's more hygienic than toilet paper. She mentions that there are no napkins in restaurants and that you can find tissues on the table. I don't recall this or this being a big deal or anything in Eastern Asia. It might be similar in that many restaurants do not leave a napkin for a place setting. Of course it can depend on the restaurant, but most won't have any place settings with forks, plates, cups and napkins. They will either bring them to you or keep them on the side where you can get them yourself. The higher scale ones or the more western ones may. She mentions that it is difficult to find lotion without whitening cream. That's funny about the whitening cream. I know they do that in Korea and funny cause many are pretty racist and discriminate against other Asians with dark skin, so I was surprised to hear that they do that in Thailand as well. I am not sure if this is difficult to find or not as I do not use lotion, but rather olive or coconut oil. I suspect like other things you could find lotion, but you are going to have fewer options. She states that many people confuse their L's and R's in Thailand. That's true for the rest of Eastern Asia as well. If your name is "Ryan" it may come out of someone's mouth like "Lion". Some of your students will likely have this problem. Here is an activity to help correct it. She states that people love their iPhones and Blackberries. True I noticed that in Eastern Asia too. She thought that they were a little bit more addicted to their cell phones than Americans. She states that people tend to walk slower in Thailand. And that it is one way of dealing with the heat. This is different from China, Korea or Japan. In Eastern Asia people tend to walk quickly. I think that this is especially true in the big cities and maybe more so in Korea and Japan. It could also be a cultural thing. Thailand is a little more easy going and Japan is more rush rush. Eastern Asia and most of America are both more "future minded". She states that women who are smaller than size 2 are considered fat. It's similar in Eastern Asia to. It doesn't take much to be considered fat. She states that the average height for men in Thailand is 5'6. I did some googling myself and in China it's about the same at 5'6. In Korea it's 5'9. And in Japan it's 5.7. She states that people will tell you if you have a zit on your face or if you look bad. That's true in Eastern Asia too. I remember a co-teacher who was sitting next to me in the office one day in Korea. He was just staring at me. I looked at him and he said, "your face is long". Then there were students who thought I looked like an eagle. Maybe it was the hair line or my nose. I do recall a women on the street asking to touch my nose. Oh, and if you are overweight your students will tell you that you are fat. In some places in America it's common to have a paper or plastic bag option. But I never saw that in Asia. She says that there isn't one in Thailand and that it is just plastic. They use a lot of plastic in Asia. I was reminded of the hot noodle soups you could get in a plastic bag in Taiwan. And even when you buy a tea at the many tea shops in Taiwan. They would give it to you in a plastic cup and then in a plastic bag. The bag was kinda practical since you could wrap it around your scooter handle bars, but it just seemed like too much plastic that's going to end up in a landfill or just discarded in the street. She said that there are a lot of random street dogs lying in the streets. They love animals and that they don't want to kill them. I remember a few street animals in Taiwan. I can vaguely remember a dog in my neighborhood in Taichung. I do remember some stray cats, but for the most part street dogs are not much of a problem in Eastern Asia. Perhaps since they are such a cheap source of food in Korea, just kidding, lol. You did know that some people do eat dog in Korea right? Well according to my Korean friends it is not that common place. It exists, but it is not like the local delicacy or anything. It is also more common amongst the older generation. She states that they use umbrellas even when it's not raining. This is true in Eastern Asia too. Women will use umbrellas to protect themselves from the sun. Regina says it is common to take your shoes off when entering a home, temple or business. Taking your shoes off is pretty normal around Eastern Asia too. I like it. I like to lie on the floor, do yoga and stuff and just prefer a clean floor. It was fine for me as my family didn't wear shoes around the house all the time. But it can be a bit of a inconvenience for some who are not yet used to it. She states that Thai's love small animals and will bring them with them such as a student she had with a flying squirrel. She states that in Thailand they normally drive on the left and walk on the right side of the street. But that the streets are a little crazy and not everyone drives exclusively on the left or right. Then she points out that in America you walk and drive on the right side of the street. Except in the countryside like where I grew up. You are supposed to walk facing traffic if there is no sidewalk. They drive on the right side of the street in Korea, Taiwan and in China. In Hong Kong and in Japan they drive on the left side. The only place that I did any driving in Asia was in Taiwan. I had a scooter and that is a bit of a different story. They are also common in Thailand (although they look a little different), but they are not used much in Korea or Japan. Anyways the streets can be a bit of a mess at times and the rules are pretty loose. She says it's socially acceptable for them to be 5 or 10 minutes late. This is not the case in Eastern Asia. Like in America you are expected to be on time. But in Thailand like in Mexico or other parts of Latin America being a little late is the norm. Different cultures have different perspectives on time. She states that there are two seasons: hot and even hotter. And that it is good for people with poor circulation. Taiwan is pretty hot and humid as well. I always wore shorts except in the winter, but I remember the coldest it would get in Taichung was around 11 degrees Celsius in the winter. Summers can be hot and humid in Korea, Japan and China too. Of course it's going to depend a bit on where you are. The further north you are the colder you can expect it to get. I saw snow flurries once or twice in Busan and a couple of inches on the ground once in Changwon. She states that some Thai's can work up to 20 hours a day such as the motorcab taxi drivers. But says that they can spend some time sleeping/resting too. I'd say people work pretty hard in China, Korea and Japan too. It sort of seemed like many people did not have hobbies. It was if they didn't have time. They just worked and spent time with their families. Regina says that Thai women can wear a pair of high heels all day. It's true in Eastern Asia too. Most women go to great lengths to dress up. You'd be surprised to see the heels and then the miniskirts women wear even in the winter in Korea. People do tend to judge you more based on your appearance and dress in Asia. She notes that the restaurants use a lot of oil in their foods. I would say that's true in China, Korea and Taiwan too. You can learn how to make a few requests though such as with less oil, no msg (common in China and Taiwan) or sugar. There was 23 random things for you about living and teaching in Asia.